Just came in my mail, pretty fresh game, had to make a dump and test it. This is the only thing you will get out of that game, after that it hangs. Tried both Interpreter and Dynarec with no difference at all. Tried pretty like all combinations of settings too, no change. 1. Characters don't T-stance anymore. whoaa,what happen? 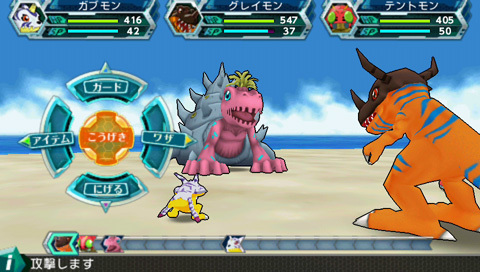 why agumon show up at first time? any news about this game? Well I was suspecting that a savegame would make it go in-game and that there is somekind of an issue with cutscenes and gameplay, hence the missing textures in the intro etc, so it looks like it's missing a function for the textures. Once it goes further I'll report it (T-stance and hangs there forever in cutscenes/battles). BTW, I guess you can move that to In-game. Game goes to battes/cutscenes, it's just that you don't see them and they take pretty looong and you get no FPS counting at the momment it happens (looks like PPSSPP hanged) and all you see is a black screen with T-Stanced characters (who supposedly should be hidding obviously behind somekind of UI that is not getting rendered). Still not really playable since you can't see the in-fight UI which is I guess vital to an RPG but if you like to torture yourself or want to debug, try it! Any news about this game in the latest build? ?